World Vision put out a presser on this developing story. Here is a BBC article from today describing Israel’s arrest of a World Vision official accused of diverting funds to Hamas. On June 15, 2016, Mohammad El Halaby, the manager of operations for World Vision in Gaza, was arrested on his way home from routine meetings. On August 4, 2016, after 50 days in Israeli state detention, Mohammad was charged with providing support to Hamas. World Vision was shocked to learn of these charges against Mohammad. World Vision programs in Gaza have been subject to regular internal and independent audits, independent evaluations, and a broad range of internal controls aimed at ensuring that assets reach their intended beneficiaries and are used in compliance with applicable laws and donor requirements. Based on the information available to us at this time, we have no reason to believe that the allegations are true. We will carefully review any evidence presented to us and will take appropriate actions based on that evidence. We continue to call for a fair legal process. World Vision is a Christian relief, development and advocacy organization dedicated to working with children, families and communities to overcome poverty and injustice. World Vision serves all people regardless of religion, race, ethnicity or gender. World Vision has been working in Israel/Palestine for over 40 years, striving to give hope to over 500,000 of the most vulnerable children, through education, health, child protection and resilience programs. Earlier this evening I spoke with a former World Vision source who said diverting funds would be very difficult but not impossible. 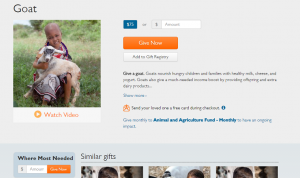 Two weeks ago, I wrote about World Vision’s gift catalog and their solicitation to purchase animals for needy families. Some readers were surprised to learn that a donation to buy a goat (or some other animal) does not of necessity lead to the purchase of a goat. Instead, World Vision’s spokeswoman, Amy Parodi,* told me that the money goes into a fund which helps support agricultural or other community based assistance for needy families. That support may or may not include the purchase of some animals. To some readers, that was new information; others had always assumed something akin to Parodi’s explanation was true. Since then, I have read more about animal donations and asked World Vision a few more questions. World Vision answered quickly and clarified some points. As it turns out, the organization doesn’t keep track of how many animals are purchased. More about that shortly. Dennis interviewed an OXFAM representative who said information about the actual use of the funds was “in big letters” in their catalog. However, Dennis said the information wasn’t on the organization’s “shopping pages” but did appear elsewhere in OXFAM’s materials. In 2011, the charity group GiveWell recommended against animal purchases, calling them “donor illusions.” On the other hand, in 2008, the progressive New York Times columnist Nicholas Kristof favored the approach. Although Richardson interviews those who don’t support the goat buying program, he seems upbeat about the program. One thing is sure; I am not alone in my curiosity. The catalog raised $33.7 million last year, $12 million of which was designated to animals. We don’t track how many individual animals are purchased each year. We used to track those numbers, but as the program has grown, the administrative burden became more than was worthwhile from a financial stewardship perspective. As you can imagine, the reality of our programming in the field is much more complex and nuanced than simply giving a family an animal in isolation from other programs and services. Actually, I probably can’t imagine it. My inability to understand the marketing versus what they actually do is why I asked. 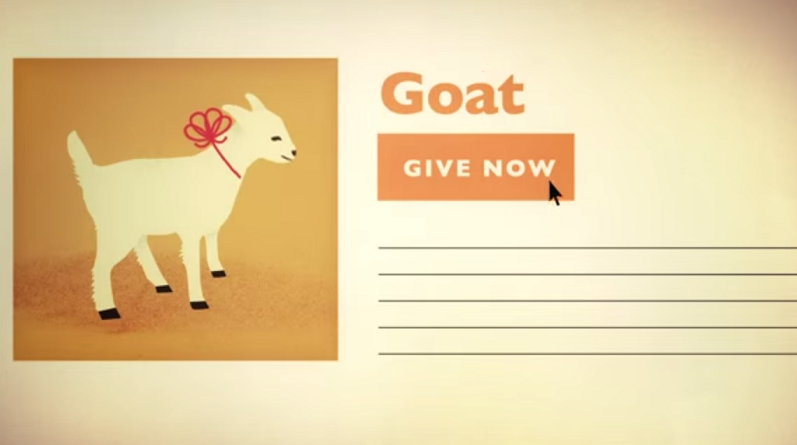 ME: Back to the goats/livestock program, it seems to me that you probably get more donations than needs for livestock. Is the excess what goes into the related agricultural projects expenses? PARODI: To clarify, in the field, we don’t have “animal” programs. Rather, we have food security programs and livelihood programs. In many of these programs, livestock are a tool we use to help families produce enough to eat and generate income for themselves. 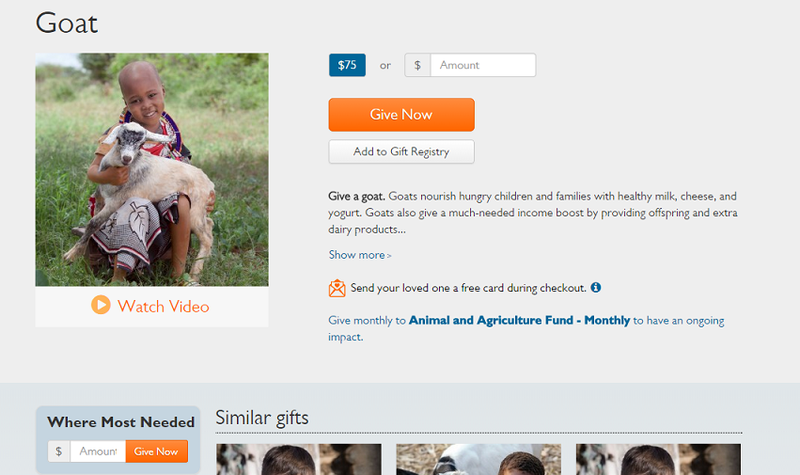 Programs that use livestock are eligible to receive funds from gift catalog animal donations. Once those livestock-specific programs are fully funded, then any remaining funding is allocated to a group of economic development, agriculture and food security programs. These programs qualify for animal money because they address the same development need that animals address – specifically, hunger and a lack of economic opportunity. Once those programs are funded, if we have remaining animal money, we then hold the revenue for use by qualifying programs in the following fiscal year. This is a relatively rare occurrence though. For example, last fiscal year, we had more $14 million in projects that met the criteria receive funding from animal revenue. But we raised a little over $12 million in animal revenue. ME: How much is sitting in a fund waiting to be spent on livestock and related agricultural projects? PARODI: Nothing is sitting in a fund for any length of time. In fact, really, money is given to the field to fund their programs before we’ve actually raised it. Before each fiscal year, our field staff submit proposals for the programs they want to run. Each fundraising office, including the U.S. office, reviews those programs, commits to fund a portion of those programs, and sends the money so that the field staff can begin (or continue) their work. Once the fiscal year begins, the fundraising offices raise resources to cover the funds they’ve already sent to the field. I think most people understand that it makes no sense to just drop a goat – and only a goat – into a family’s lap. World Vision’s integrated programming helps families overcome hunger and poverty – and uses goats and other animals as a tool to accomplish that. But there are times when animals aren’t the right tool. The items in the gift catalog give donors a glimpse into some of the tools that we use to make those programs happen, but the programs themselves include much more than just the items in the catalog. All organizations that offer gift catalogs have to address the tension of helping their donors understand the needs and the best solutions without overcomplicating the conversation. We all need to honor the promises we make our donors – and we need to be careful not to promise something that we can’t deliver. You’ll find that most catalogs articulate similar language about how donations will be used. Parodi says “most people understand that it makes no sense to just drop a goat — and only a goat — into a family’s lap.” I am not as confident as Parodi. In absence of a well-designed survey, I am not confident about “what most people know.” I can point out that a donor who donated based on a gift buying trip through World Vision’s website wouldn’t know any of what I now know. See for yourself. First click here (World Vision’s front page), then locate the Gift Catalog (link), then click “animals” (link), and choose any of the animals (e.g., rabbits), then go to your cart (link – should be something in there if you checked an animal). I went through the checkout process and found none of the information provided above on any of those pages. In the video, Jack buys a goat on his mother’s behalf and Isaiah gets a goat dropped into his family’s lap. Perhaps the video is not meant to be taken seriously, or maybe it intends to create a friendly myth, like the tooth fairy or Santa Claus. Someday Jack’s dad is going to read this blog and have to tell Jack the truth. In my view, a better approach would be to provide this information to potential donors more directly so they can know the extent of the complexity of the situation. One of the naysayers in Richardson’s Where’s My Goat? documentary (about 2:36 into the video) said that the gift catalog is about “Western feel good, and not about serious development.” I understand her point and think there is a risk that the creative fiction could lull us into an ignorant satisfaction. I’m not sure it is good for us to think we have done our part via a gift donation at Christmas. *Thanks to Amy Parodi for her kind and professional help in providing information and World Vision’s response for this post.